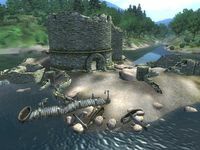 This page is currently being redesigned for the Oblivion Places Redesign Project (OPRP). 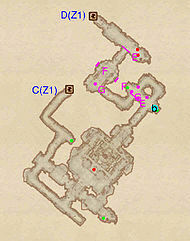 The page needs in-game walkthrough(s) to go along with the maps and content lists. If you make an addition to this page, please update this template accordingly, but make sure you have observed the project guidelines. Needs in-game verification. See the OPRP project page for explanation of what needs to be to complete the verification process. 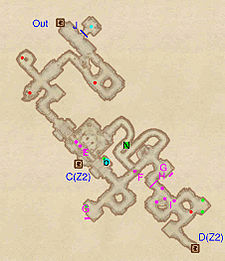 Fort Grief is a medium-sized fort northeast of Bravil containing NPCs (quest-locked). It contains two zones: The Hunter's Run and The Hunter's Abyss. Caught in the Hunt: Ursanne Loche's husband is missing! The gate to the Fort is locked but can be opened by turning the handle on the ground nearby. However, unless you have begun the Caught in the Hunt quest in Bravil you will receive a "... rusted ... won't open" message. You cannot fast travel when you are in the exterior part of the fort ruins. 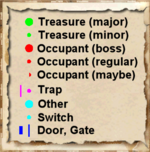 This location's map marker (M on map) is named Fort Grief (editor name FortGriefMapMarker). The entrance door is ENE of the marker, 140 feet away. Esta página foi modificada pela última vez à(s) 19h55min de 19 de julho de 2014.